Gorilla Safety Hook For Cordless Power Tools - ONLY £17.99 (+VAT) - SAVE £2! NEW ONE-KEY MODEL! RRP: £459.99 (+VAT). SAVE £90! Milwaukee M18 ONEIWF12-502X Fuel ONE-KEY 1/2in Friction Ring Impact Wrench. Supplied with: 2 x 18 Volt 5.0Ah Li-Ion Batteries, 1 x Charger and 1 x Heavy-Duty Case. HEAVY USAGE MODEL - for intensive use on-site every day. Featuring Milwaukee's heavy-duty brushless motor. Connects via Bluetooth with the Milwaukee ONE-KEY app. Allows for complete tool customisation, allowing you to tune the tool to your needs. Configure to any application, choosing optimum tool settings for repeatable precision. Save up to 4 custom settings to the tool's memory for fast selection on the jobsite. Milwaukee electric impact wrench offers 4 modes of operation thanks to its unique Milwaukee DRIVE CONTROL, which allows the user to shift into four different speed and torque settings to maximise versatility. Mode 1: For precision work. Mode 2: Helps prevent damage to fasteners and material. Mode 3: Delivers maximum performance for the toughest applications. Mode 4: Intelligently detects when the tool has impacted on a fastener for one second, automatically shutting the tool down, reducing overdriving and preventing damaging materials. No Load Speed: 0-2,000/min, Impact Rate: 0-2,600, Torque: 0-120Nm. REDLINK PLUS intelligence system delivers the most advanced digital overload protection for tool and battery and uniquely enhances the tool performance under load. Individual battery cell monitoring optimises tool run time and ensures long term pack durability. 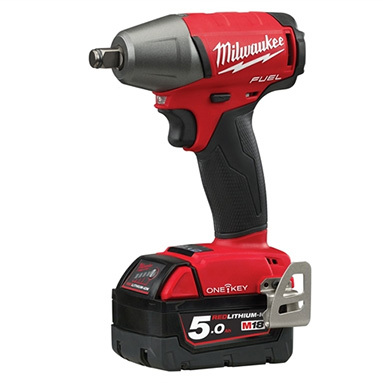 This Milwaukee impact wrench is fitted with a powerful Milwaukee designed and built brushless POWERSTATE motor, with an on-board fuel gauge and an LED work light. Bit Holder: 1/2in Friction Ring. 2 x 18 Volt 5.0Ah REDLITHIUM-ION Batteries. REDLITHIUM-ION battery pack delivers up to 2.5x more run time, up to 20% more power, up to 2x more battery life and operates better down to -20°C than other lithium-ion technologies.